Gaza: In the minutes before the ceasefire kicked in at Gaza this morning, Hamas fired a flurry of rockets towards Israel - 30 according to some counts. Israel has argued that that these rockets are fired from civilian areas, and this is why its retaliatory strikes can result in civilian casualties. 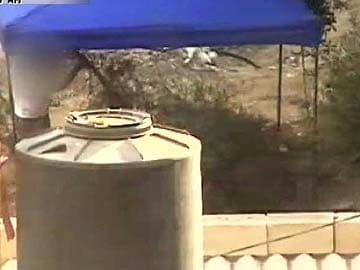 But this morning, NDTV witnessed one such rocket silo being created under a tent right next to the hotel where our team was staying. Minutes later, we saw the rocket being fired, just before the 72-hour ceasefire came into effect. It began with a mysterious tent with a blue canopy that bobbed up yesterday (August 4) at 6:30 am in an open patch of land next to our window. We saw three men making a multitude of journeys in and out of the tent, sometimes with wires. An hour later, they emerged, dismantled the tent, changed their clothes and walked away. The next morning - today - we woke to news of the 72-hour ceasefire but just before it was to take effect, the rocket next to our hotel was fired. There was a loud explosion and a whooshing sound. The cloud of smoke that rose was captured by our cameraperson. This report is being aired on NDTV and published on ndtv.com after our team left the Gaza strip - Hamas has not taken very kindly to any reporting of its rockets being fired. But just as we reported the devastating consequences of Israel's offensive on Gaza's civilians, it is equally important to report on how Hamas places those very civilians at risk by firing rockets deep from the heart of civilian zones.